Cyclone Steel, in business since 1979, serves an ever‐growing clientele of engineering, manufacturing, fabricating and machining firms in multiple industries and states. Most importantly, we have earned an industry‐wide reputation for reliability in providing properly documented flame‐cut steel plate parts to both our customers’ and industry specifications. Our expertise in plate processing includes rolling, forming, machining, ASME & AWS Welding, and other value added work, allowing us to supply early‐stage or turnkey parts meeting a variety of customer requirements. Loyalty and longevity — among both customers and employees — is part of our DNA. Several Cyclone Steel customers have been with us for over 30 years and 7 of our employees have tenure of over two decades of service with an additional 4 approaching that milestone. Our culture of business integrity, quality, customer service and relationship‐building permeates the organization from the top down. 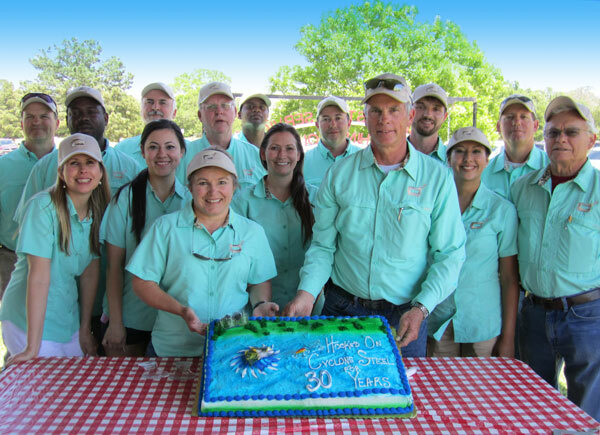 As an example of how Cyclone Steel forms longstanding relationships with its stakeholders, our organization has hosted an annual fishing tournament bringing together employees, suppliers, customers and their families for 30+ years. On a Friday night each May, CEO & President Steve Lesikar personally cooks steaks for every guest so he can greet them before Saturday’s tournament. The fishing competition concludes with a BBQ lunch, entertainment for all and a lively tournament awards ceremony. Our continuous focus on people — both inside the workplace and outside in the marketplace — has resulted in a dedicated internal team and longstanding customer relationships that developed from routine business dealings into true partnerships.